I can't remember a time I didn't love the Fancy Feast cat. It was certainly long before I got a cat of my own, and continued on even long after I did. For a few years, I even collected and traded in cat food can labels, just so I could get the annual Fancy Feast plush holiday ornament (it's worth noting that I don't even celebrate Christmas). The gourmet cat food brand is working with Hall in asking consumers to submit recipes to help inspire the next Fancy Feast Elegant Medleys Entree. Carla will be among one of the judges picking the top five finalists, and the ultimate winner will be determined by a public vote, during which time, a donation for each ballot cast will be made to adoptapet.com. I'm going to respectfully decline entering, as some of my cat's favorite flavors include "butter" and "olive oil" (good luck leaving your toast unattended), but I wish a hearty good luck to all ye who venture forth in the competition! The lucky winner will receive $10,000, a years supply of Fancy Feast, and the enviable distinction of seeing their kitty culinary creation hit the shelves in about a year. Now if only they could make cats cook the actual food, then maybe we could have the next Bravo hit on our hands! Are you listening, Andy Cohen? 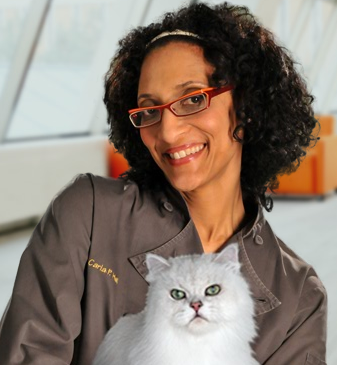 On a side note, while visiting the headquarters of Nestlé Purina Petcare in my quest to become the first ever Purina Cat Chow Correspondent, I announced to a member of the Cat Chow team that I wanted to meet the Fancy Feast cat. I was jokingly told that he lives in a "penthouse in the tower," but I actually did get to meet two real-life kitties who live at Purina, and hope to get the chance to share their story with you soon! I have an obsessive compulsive disorder when it comes to the Fancy Feast Christmas Ornament. Everyone who knows me knows it is the highlight of my tree and my Christmas. No really.That is all you can see on my tree! I have been collecting since 1986, and am only missing one year. I rip off every label and have jars and cans of them "stored". I was VERY UPSET (let me say agitated) to find out they were not offering this gem for 2010! Then my mom calls and says "Your Fancy Feast Ornament is here" (I send them to several relatives so I can have "back up ones"). And I tell her "No it is probably a cat food sample, they aren't having them this year." WELL, come to find out (I tell her to open it to make sure) IT WAS A SECRET SURPRISE ORNAMENT!! If you become the Purina correspondant, can you please tell them that some of us can't let go and THEY MUST CONTINUE the ORNAMENT!!! PLEASE!!! I love Fancy Feast kitty, too! She's got a lovely coat. @Caren I LOL'd at your flavor recommendation! That sounds about right! Thanks! They sent beautiful Fancy Feast Glass ball ornaments to everyone who participated in the last year. I called and thanked them and they sent me another!! Sounds like fun for those with a flair for cooking! haha! Like Caren's Plastic Bag a' la Lint Biscuits.